Lymph from pelvic organs returns via the lymphatic vessels and nodes of the pelvis. The size, location and number of various groups and sub-groups of lymph nodes in the pelvic region are different in different individuals. They are accountable for the elimination of interstitial fluid from tissues. They carry white blood cells towards and via the lymph nodes within the bones. They help in maintaining the immune system. External iliac nodes are located superior to the pelvic brim, near the external iliac vessels. Along with pelvic structures, particularly the superior portions of the middle to anterior pelvic organs, they also obtain lymphatic drainage via the inguinal lymph nodes. External iliac nodes drain into the common iliac nodes. Internal iliac lymph nodes obtain their drainage from the inferior pelvic viscera, deep perineum, and gluteal region. A mass nearby the anterior and posterior branches of the internal iliac artery and the origins of the gluteal arteries is created by them. They get their name from the internal iliac artery. They drain into the common iliac nodes similar to the external iliac nodes. The sacral group of lymph nodes is located at the concavity of the sacrum within the pelvis. They connect with lymphatic vessels which travel nearby the median sacral blood vessels. They obtain lymph particularly via the posteroinferior pelvic viscera. They channel either towards internal or common iliac lymph nodes. Inside the pelvis, other lymph nodes are generally drained by common iliac lymph nodes. They are found superior to the pelvis and via the sacral, external iliac and internal iliac lymph nodes acquire thier drainage. Mainly, they drain in the caval and aortic lymph nodes. From some pelvic organs, a little direct lymph drainage takes place into the common iliac nodes. 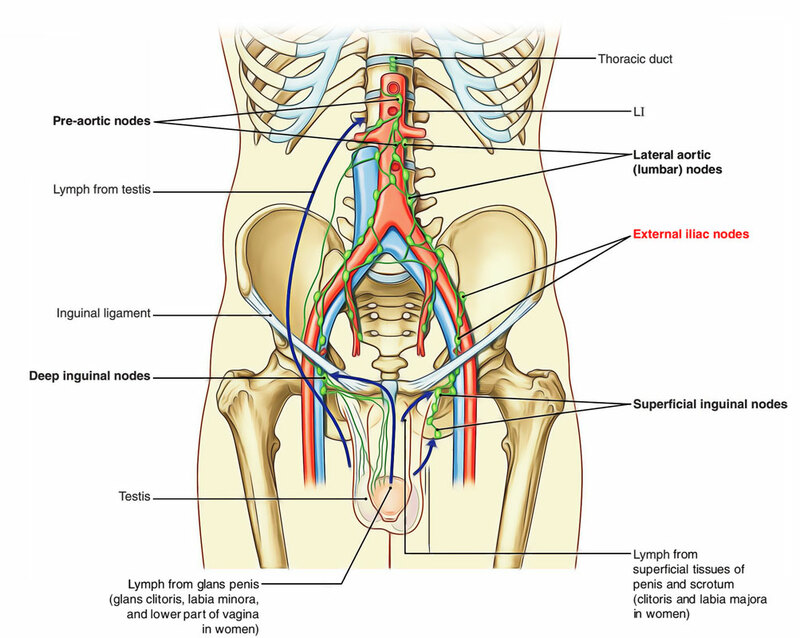 Lateral – They are direct extension of external iliac lymph nodes. Posterior – They obtain lymph from external and internal iliac nodes. Medial – They receive lymph from internal iliac nodes and are located inferior towards the aortic divergence. In case of the females, Lymphatic drainage from the ovaries and uterine tubes travel behind the ovarian veins towards the lumbar lymph nodes that include the caval and aortic lymph nodes. The lymphatic drainage of the testis and epididymis also drain inside lumbar nodes despite the fact they are located outside the pelvis in males.